An encounter with a humpback whale is best described as eerily peaceful–magical even. In the Caribbean waters, these gentle giants migrate north each year, and when they do, divers and snorkelers head to Turks and Caicos for a once-in-a-lifetime encounter. 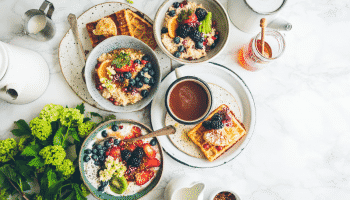 Elsewhere in the Caribbean, animal lovers swim with giant Manta rays at Manta City, ride rescued horses in Montego Bay, and take it easy with wild pigs on “Pig Island” in the Bahamas. If an animal encounter is high on your travel bucket list, the Caribbean will have you swimming with (friendly) sharks one day and flocking with flamingos the next. Check out these wild animal encounters. 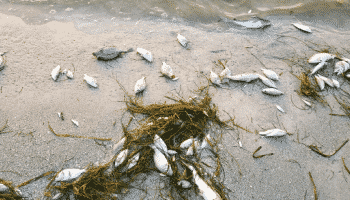 Visit Big Major Cay for an unexpected sighting of boarish friends waddling along the shores. 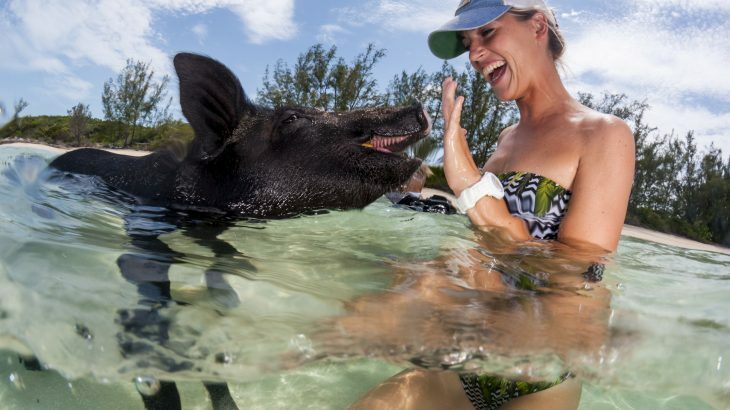 Also known as “Pig Beach,” this island in the Exumas has risen to fame thanks to its hungry inhabitants. The only way to get to Big Major Cay is by boat, so plan to either charter one or board a guided tour. As you idle in, you’ll pass several swimming pigs, and as they get closer, you’ll find they’re not shy to humans. You’ll want to pack pitted fruits and vegetables as treats for their affection. 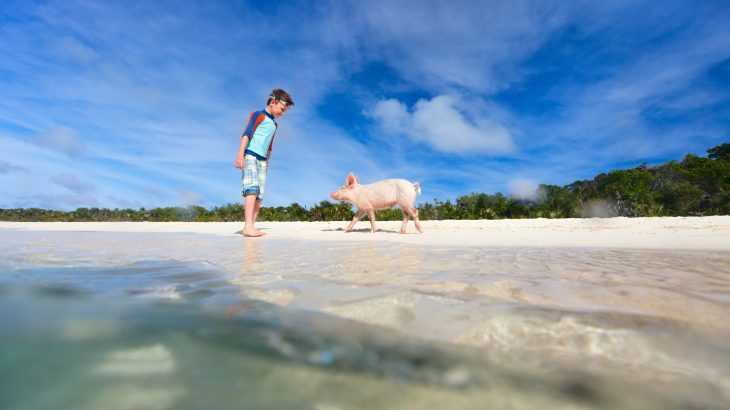 It’s a big mystery how the pigs arrived on Big Major Cay, but there are many local rumors – from a shipwreck, to a hopeful pig farmer, Wayde Nixon, who thought a tropical island would be the perfect setting to raise livestock. Nixon even explained on the Today show the pig farm was part of a sustainable food supply back-up plan in case the Y2K computer meltdown of the new millennium happened. The only way to get to Big Major Cay, also known as “Pig Island,” is by boat. Schedule a charter with 4C’s Adventures or opt for a boat rental with Exuma Vacation. Don’t let their tough appearance scare you–nurse sharks pose no threat to you if you choose to splash around with them. Unlike your typical sharks, nurse sharks are bottom feeders, meaning they eat by sucking crustaceans and other small creatures from the ocean floor. 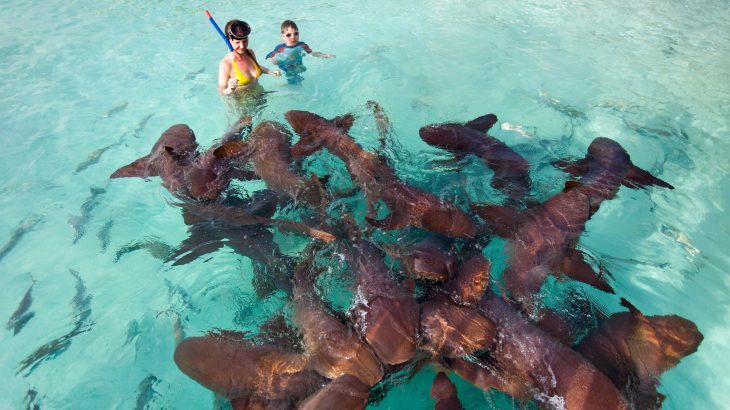 At Compass Cay, the nurse sharks are the main attraction and after years of human contact, they are not shy. From several feet to seven feet long, these sharks swim passed and even nudge you, giving you the chance to pet their smooth skin. Visit Compass Cay Marina in the Exumas to experience the nurse sharks for yourself. Get there by boat, or by air with a charter company flying from Florida and the Bahamas. 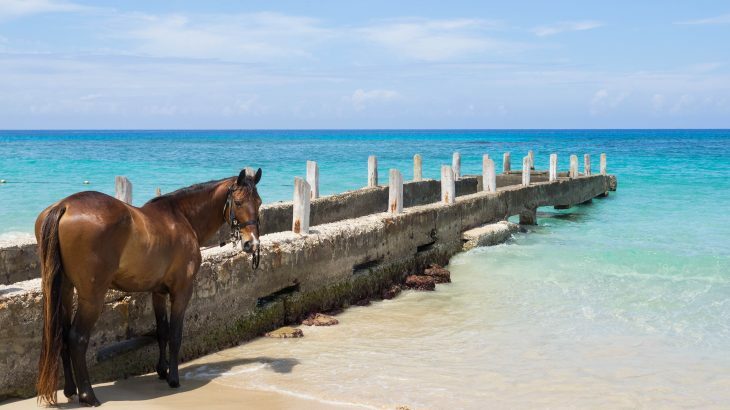 If you love horses, and want to enjoy their company in the most humane, eco-friendly way, Half Moon Equestrian Centre at Half Moon Bay in Montego Bay, Jamaica is for you. Injured, stray and abandoned horses, among many other animals, find a forever home here, where they are rehabilitated and cared for. The center offers many equestrian experiences, from riding lessons to polo classes, but the most memorable by far is the Turf and Surf Experience. 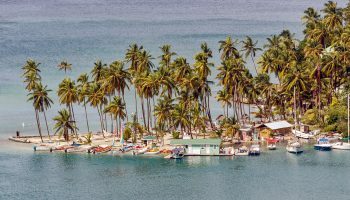 You’ll take an hour-and-forty-five-minute ride along Sunrise Beach, where you’ll unsaddle and then head into the warm waters of the Caribbean Sea on bare-back. The center also offers the Sand Stroll for those who prefer to stay on land. During this 45-minute ride, an instructor leads landlubbers on a ride along Sunrise Beach. Visit the Half Moon Equestrian Centre to reserve your ride. Remember closed-toed shoes are required to ride. 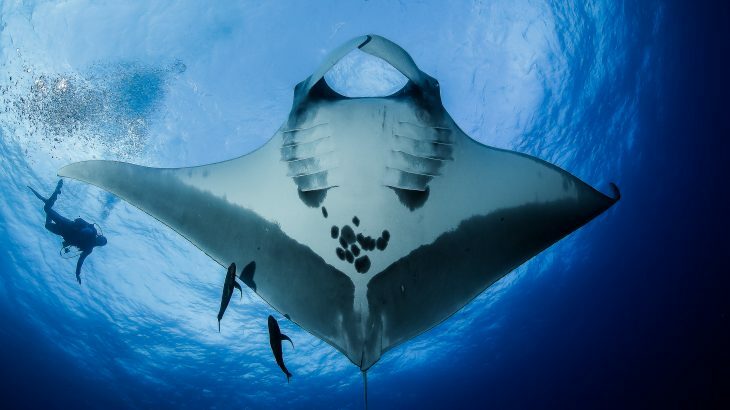 Off the coast of Tobago, Manta City is a dive site for epic giant Manta ray sightings. Weighing up to one ton, these gentle giants are inquisitive in the warm waters of the Caribbean and glide passed divers, tapping them with their smooth, massive wings. Visit here during spring and early-summer for the best sightings. For more dive sites with Mantas, head to the waters off Grand Turk and Providenciales in Turks & Caicos. Book a diving excursion with Blue Waters Inn in Speyside. 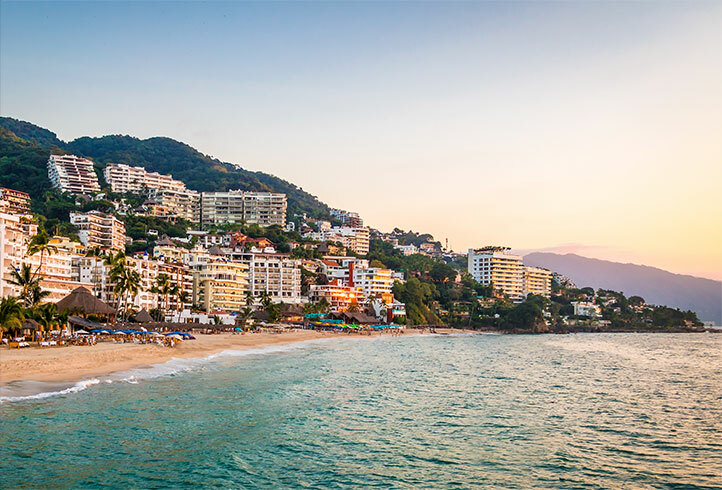 This diving company offers different packages, but you must be certified SCUBA to participate. 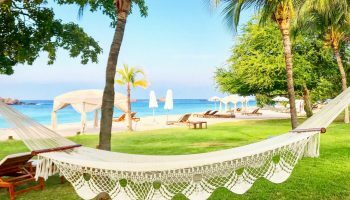 Book at least one night at the Renaissance Aruba Private Island resort to visit Flamingo Beach, or, if you’re lucky, score one of the 30 daily island passes reserved for non-guests. 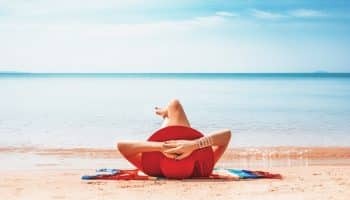 The resort limits the number of guest passes to avoid overcrowding, and it’s a blessing – here you can lounge on a quiet stretch of sand with a pink friend in sight, or get more involved by feeding these friendly guys. The only way to get to Flamingo Beach is to take a boat that leaves from the lobby of the hotel every 15 minutes. Keep in mind that while kids are allowed on the island, they are not permitted on Flamingo Beach. 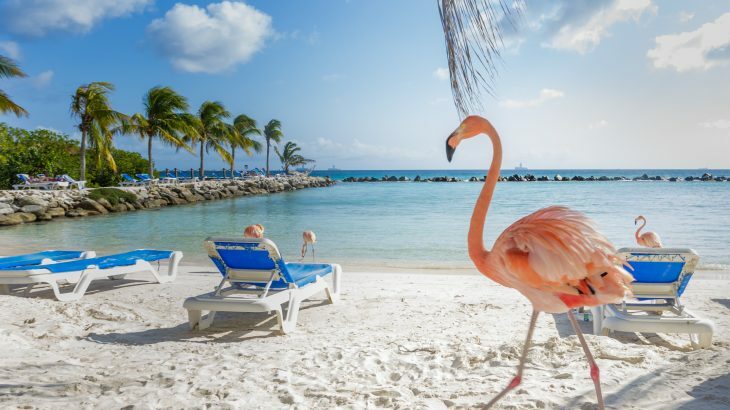 The best way to get access to Flamingo Beach is by staying at the Renaissance Aruba Private Island resort. If you plan to stay elsewhere, buy a day pass for $100, although these are limited to just 30 passes per day. 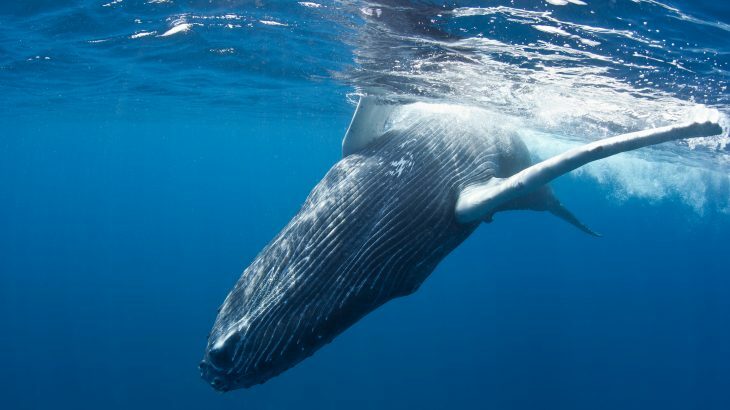 In the months of January through April, humpback whales migrate north from the Atlantic to the much warmer Caribbean Sea. They meet in the Turks Island Passage near the Turks and Caicos and Dominican Republic, where they mate and give birth. Salt Cay makes for the perfect place to catch a glimpse of the whale calves with their mothers up close. Keep an ear out for the male humpbacks who “sing” for 10-20 minutes at a time as part of their mating call. Unlike other whale watching destinations, at Salt Cay you can board a much smaller boat to see the whales. While this may seem more daring to passengers, it provides a much closer viewing. It is likely, depending on the mood of the whales and ocean conditions, that you will be able to snorkel alongside the giants – an unbelievable in-water experience. 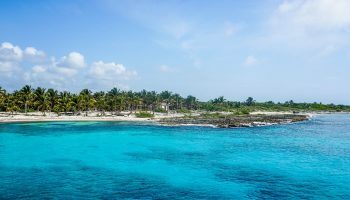 Board a private charter with Crystal Seas Adventures, or opt for their Whale Adventure, which includes lunch on Salt Cay, from January to April.